In case you are stuck in an environment that still needs JRE 1.3.1_02, don’t try to install J2SE Runtime Environment 1.5.0_06-b05, it apparently destroys the ability to load 1.3.1_02. Toyota is leaving the IRL, for NASCAR Nextel Cup racing? I can only wait for the Avalon jellybean or the Lexus brand to become the next Pontiac/Buick….. Spreading the content around was the only way NASCAR could make deals affordable for its partners. Both Fox and NBC lost money on the last deal and in declining to extend its contract, NBC said the value the network put on the NASCAR package was far less than the asking price. You mean turning left for 4 hours doesn’t sell advertising time? Micheal Andretti going to try to win at Indy again. Michelin is taking it’s toys and going home after 2006, thanks to Mr. Ecclestone. And World Champion Fernando is tired of winning, so after this season, he’s going to McLaren-Mercedes. Maybe he can keep the parts from flying off the car. WRC is going to be a challenge to watch at first, all the drivers are changing makes, models and teams. It’s been too cold out the last two days to take a decent outdoor shot, or to wash it, so there it is, in all it’s salty, grimy silverness. And, yes, before you ask, the Dakota is gone, it got traded in. 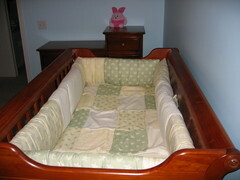 Last weekend we picked up the combo dresser/changing table, this weekend we picked up the 2-in-1 mattress. 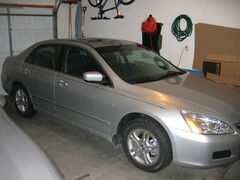 Amazingly enough, it fit in the Honda Accord Coupe with the back seat folded down. I caught a news story today that gave a link to the National Archives AAD interface. I saw the World War II section and plugged in my grandfather’s info and got this. It was -4F when I got up this morning. But, it was -45F in West Yellowstone, MT. I bet it was colder than that where this picture was taken. I didn’t think this would ever pass, but the Urbana City Council has committed to reducing Lincoln Ave to 3 lanes. I’d assume this is only from Florida Ave to University, but who knows. This brings up a recurring argument I’ve had with some people at work who don’t think that changing lane counts and stoplight designs discourages people from using Green St now. They say that all these changes do is increase traffic delays in the altered areas. I’m starting to think that without more aggressive commuter education, changes to Lincoln Ave will prove that they are right, I’m wrong and drivers/commuters in Champaign are too stupid to learn a new way home. Anyone who commutes daily on First St should have figured out by now that you shouldn’t even try to turn left onto Green on the way home. Go another block north, use the left turn lane and light onto Springfield and save yourself 10 minutes of trying to find a gap in the southbound traffic. But everyday on my way home, there’s a line of 20 cars trying to turn left onto Green, most of whom are just going over to Neil to go north. I understand there are probably college students with cars that don’t know another way to North Prospect, but surely us long time residents of Champaign-Urbana and the surrounding areas can learn a new way home when we begin to notice that our commutes have gotten longer and longer…. 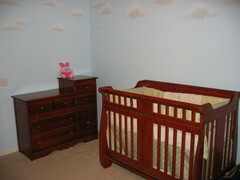 We’ve got clouds on the walls, a bookcase and the crib. The clouds were done with a Cloud Kit from Home Depot and they look really good. 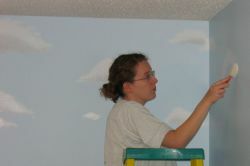 It’s easy enough that I can do it, though my clouds don’t look any where near as good as Alisha’s. The bookcase came from Menards, they had to special order it after a little inventory issue with their Ready To Assemble furniture area. The crib is a Baby’s Dream Generation Next 3 in 1 from Babyland in Savoy.